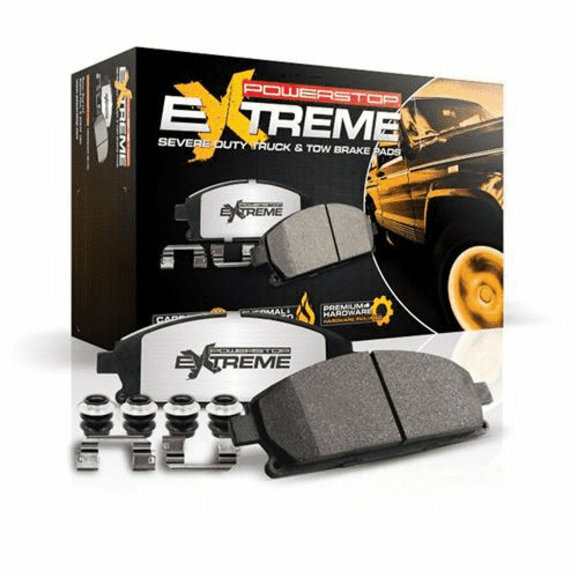 Power Stop Z36 Extreme Duty Truck And Tow Rear Brake Pads are metallic brake pads that are made for 18-19 Jeep Wrangler JL Rubicon with higher gross vehicle weights. If your operating conditions exceed the ability of the stock braking components, Power Stop Z36 Extreme Truck and Tow brake kit provide that extra stopping power to bring your Jeep to a swift halt. This is the ideal Kit for those who haul loads or tow trailers. The Z36 Carbon-Fiber Ceramic formula offers extreme braking performance that is designed for Jeep 4x4s without sacrificing everyday driveability. Extreme Duty: Thermally stable compound to provide stopping power when you need it most - especially when towing and driving down hills. Durable Construction: Engineered with a Carbon-Fiber Ceramic formula that gives this Brake pad kit extreme pad bite and offers superior performance to avoid high temperature brake fade. This Brake Pad Kit is excellent for Larger Tire and Wheel Upgrades. Noise and Dust Free: No more embarrassing, noisy brakes will be part of your driving experience! Power Stop tests all pads for noise-free braking. Also, all Power Stop Carbon-Fiber Ceramic brake pads feature a dust-free friction formula.